the members of the center for geometry and computational design cordially invite faculty, students, company representatives, and the public to the fifth symposium on geometry and computational design, at tu wien on october 25th, 2018.
leading researchers will give lectures on recent developments in geometry, computer graphics, computational design, and civil and architectural engineering. selected and ongoing research projects within the center will be presented in short talks, on posters, and in an exhibition. the symposium will be free of charge for all attendees. 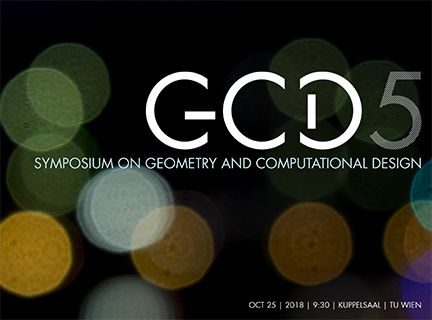 registration, via email to gcd-meeting@geometrie.tuwien.ac.at, is open until october 21st.